A Swedish startup company claims it has made a breakthrough in graphene technology, a material of intense interest to many industries. Graphmatech, or Graphene Material Technology, a materials startup, says it is sharing its “good news” at the ongoing Hannover Messe event, where it present as co-exhibitor within Sweden Co-Lab, a place for smart innovations. Epson Robots will be showcasing its award-winning line of SCARA and 6-axis robots at Automate, as well as introduce three new robotics solutions. In addition, the company will lead a discussion for users new to factory automation. Aptis, the 100% electric bus from Alstom, is in Italy, after touring Spain, France, Belgium, Holland and Germany. The tour started from Florence, in the splendid setting of the Basilica of Santa Maria Novella. It will tour six Italian cities up until May. Aptis will be in passenger service in the Tuscan capital, free of charge, for 13 days and will be operated in collaboration with ATAF. It will cover seven different circuits, from the centre to the periphery. Since the prototype was presented in March 2017, more than 40,000 kilometres have been covered in real operating conditions by four test vehicles in Europe. Universal Robots has launched a global network of training centers. The collaborative robot-maker says it aims to lower automation barriers with robotic programming classes for beginners and advanced users. The initiative is part of the company’s “mission to make the advantages of collaborative robotics widely accessible”, says Universal Robots. “Integrated Industry – Industrial Intelligence”, the digital networking of man and machine in the age of artificial intelligence – this is the topic of the world’s largest industrial exhibition this year, the Hannover Messe. Mitsubishi Hitachi Power Systems, Ltd. (MHPS) is putting unmanned aerial vehicles (UAVs) into practical service to more easily and efficiently inspect the interiors of power plant boilers and other large indoor structures. Demonstration testing for manually operated drones was completed last year, and MHPS plans to begin offering the inspection service from April 2019. MHPS is also pursuing development of autonomous UAVs, together with research and development firm A.L.I. Technologies Inc. 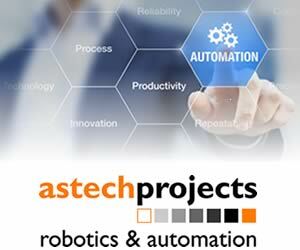 The characteristic light-blue jointed collaborative robot arms from Universal Robots (UR) will be spotted hard at work throughout Automate and ProMat 2019 in Chicago April 8 – 11. 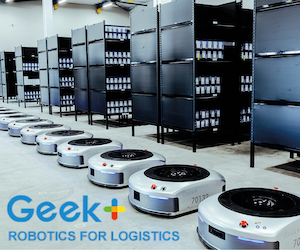 More than 30 UR cobot exhibitors will demonstrate a total of 80+ collaborative robot applications: a testament to the wide range of tasks and solutions now automated by UR. The cobots on display will handle vision-guided product inspection, pick parts off conveyors, ride on top of mobile robots while performing machine tending, perform live robotic sorting and induction into put walls and pouches, add 7th axis capabilities, hand giveaways to attendees, play golf on a putting green, and much more.